With its captivating dial and graceful satin-brushed leather strap, this OMEGA De Ville Prestige is a timepiece of true beauty that draws on the enchantment and aesthetics of nature. 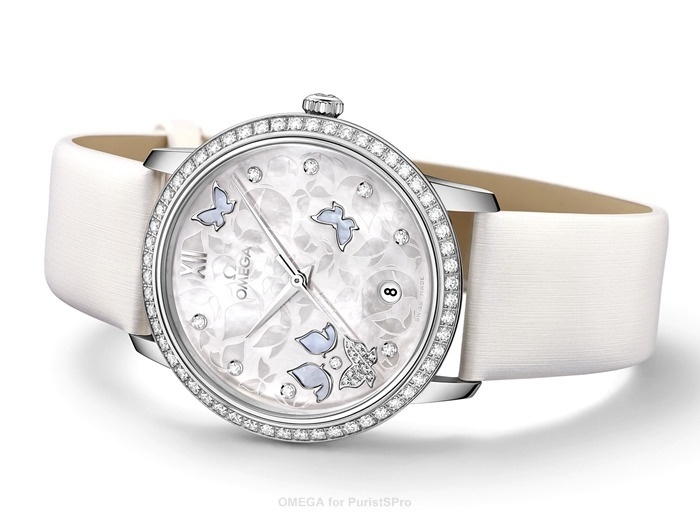 A mother-of-pearl butterfly pattern decorates the unique dial adorned with nine diamond indexes set in 18K white gold holders and a date window at the 6 o’clock position. Enhancing the charm of this exquisite timepiece is a diamond-paved butterfly positioned between 7 and 8 o’clock, which complements the 18K white gold bezel set with more than 50 full-cut diamonds. The polished hour, minute and seconds hands are fashioned from 18K white gold and match the case and embellishments. A domed scratch-resistant sapphire crystal with anti-reflective treatment on both sides protects this lively dial. The 36.8 mm case is presented on a white satin-brushed leather strap with a mother-of-pearl effect and an 18K white gold buckle. The De Ville and OMEGA logos are engraved on the vertically brushed caseback. Powering this De Ville Prestige is the Co-Axial calibre 2500, the automatic movement which, when it was launched in 1999, introduced the Co-Axial escapement and signalled a revolution in mechanical watchmaking. This OMEGA De Ville Prestige is water resistant up to 3 bar (30 metres / 100 feet) and is delivered with a full three-year warranty.